Chrysmela earring backs lock earrings—like investment pieces and sentimental favorites—in place so you can wear them worry-free. Nine precision-machined parts, including three micro ball bearings built into the back auto-adjust to an earring post to hold it firmly in place and can grab the notch in the post for extra security. 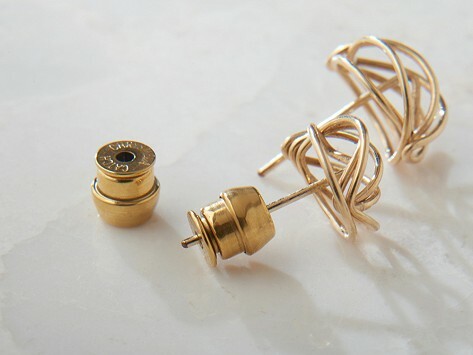 Now your earrings can stay secure until you unlock them. Made with platinum- or gold-coated surgical stainless steel to be both long-lasting and to blend in with those extra-special earrings. I LIKED THE QUALITY OF THESE EARRING BACKS . I'M STILL WORKING WITH THEM SO I KNOW HOW TO TAKE THEM OFF WHEN I WANT TO . TAKES SOME TIME . Look great and do exactly what they’re supposed to do. Like them a lot, so much so, I just got my second pair! Love it, not longer losing my diamond stud. Fits great! The earring backs are made in Japan at high-tech factories that also make smartphone cameras and watch mechanisms because Eri wanted her backs to be made to precision. That attention to detail results in an earring back that won’t budge—and that can provide lift for heavier earrings, too. With a pair of these backing up your earrings, you can wear favorite pairs with confidence that they’ll stay put no matter what you’re doing.